In Suh’s artwork one can sense an attentiveness to time-honored practices in Asian art, particularly the craft of papermaking in Korea and scroll painting, along with an innovative approach to these practices that distills their material essence. Suh builds up each artwork through an accumulation of discrete units of paper rolled into tubes or overlaid so that they resemble thin blocks of wood. Each one contains so many individual paper scraps compressed together that when they are cut by him their ends resemble the horizontal cross section of the trunk of a cut-down tree with its annual rings. These are affixed to the support by Suh with a rice-based glue in either a fairly ordered way, or more randomly to create specific visual effects. He cuts each piece by hand, eschewing machinery for the intentional imprecision of the personal touch. The artwork of Suh Jeong-min employs the timeless structures of geometry while simultaneously pursuing an idiosyncratic aesthetic that combines cultural references with unusual formal techniques. These elegant and somewhat imposing works are neither painting nor sculpture, yet have properties of both, and extend recent trends in art such as the privileging of material and the use of language into new territory. 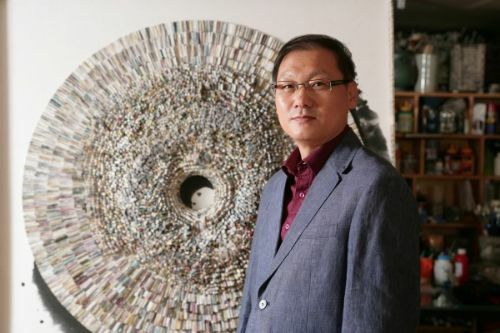 For some viewers, Suh’s artwork will arouse curiosity about Korean culture through its attractive, tactile surfaces, while others more familiar with his materials will find themselves rediscovering these materials in new and unexpected ways. The paper Suh uses is called hanji, and is made from the inner bark of Mulberry trees. This paper is usually formed into laminated sheets that are pounded to compact the wood fibers, giving it great resilience and durability. The world’s oldest surviving wood block print, the Buddhist “Pure Light Dharani Sutra,” which is Korea’s National Treasure No. 126, was printed on hanji in c. 704 and is still in good condition. Hanji is so sturdy that it was used to make furniture such as cabinets and trays, and as a window covering. As a craft unique to Korea, hanji is considered integral to the culture, and so its use by artists can be considered an acknowledgment of this traditional craft, albeit in a distinctly non-craft way. Its use also shows how an aspect of culture long superseded by technological changes can continue in a transformation from the commonplace to the exceptional through an artist’s innovative methods. In earlier works on paper Suh used graphite to build up geometric shapes in varying densities, and has retained this compositional device in the wall pieces. From afar, the overall geometry and patterns within them, made by the arrangement of lighter and darker paper units, give some of these works the appearance of an updated take on the mandala, a schematized representation of the cosmos through a configuration of geometric shapes, here without images of deities. In other pieces Suh arranges the paper units in subtle tonal shifts from light grey to grey-green or blue, or bright yellows and reds, making imagery that appears to hover just outside perception, like distant galaxies seen through a telescope, or fields of grain. The ink that can be seen bleeding through the paper on the incised edges of the rolled-up tubes hint at the contents within, causing the viewer to wonder at their hidden messages. These paper units, whether arrayed in concentric circles, set side by side in rows, or set on top of each other like hastily stacked lumber, have a dense bodily presence, and give these works, despite the lightness of the material, a visual weightiness, owing in part to their scale—many of them are the height of an average person and as wide as a picture window. While paper has the connotations of flimsiness and fragility, no such impression is given by Suh’s work—quite the opposite is true. They appear to be as solid as a building, and although made up of flexible, organic elements, are quite substantial in their final form. They command the wall in a way that causes viewers to take them in from afar as minimalist constructions before their variegated surfaces come into play. These artworks share the characteristic of raised surfaces with wall-relief sculpture, yet are diffusely colored and patterned, like painting. Crossing techniques of two-dimensional painting with those of three-dimensional sculpture, Suh conflates figure and ground so that form creates image. Their merger does not feel forced in this work, but rather natural in the sense that he is true to the nature of the material. On closer inspection, the individual units of rolled and compressed paper give the work a density and presence unlike a typical painting, and command the eye with their teeming mass and detail. The surface abounds with tiny variations in tone and texture, rewarding a prolonged interaction. Even the edges of the paper units, cut on the diagonal or through a block, show infinitesimal variety. The ink that can be seen bleeding through the paper on the incised edges of the rolled-up tubes hint at the contents within, causing the viewer to wonder at their hidden messages. 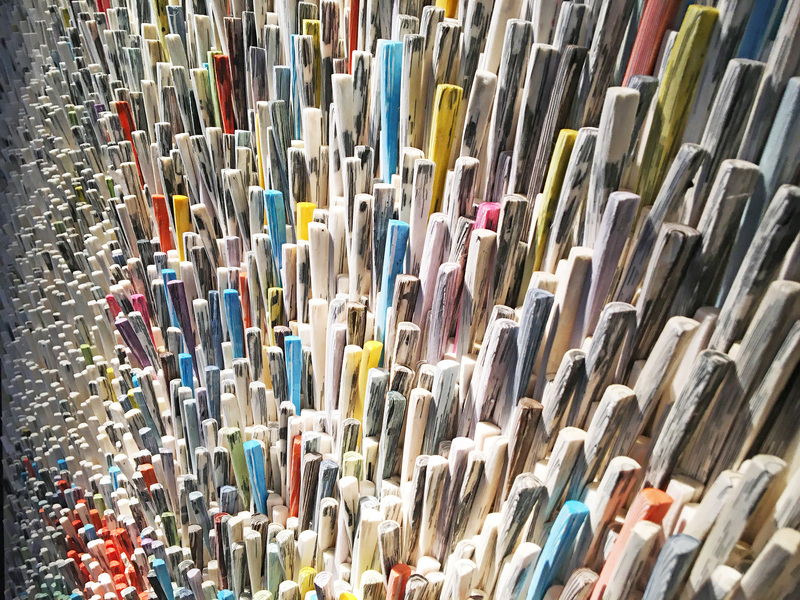 It is in the unseen core of the paper units that Suh’s artwork generates its unique properties, for each scrap of paper comes from other artists’ discards. Traditional calligraphy and literati ink paintings on paper scrolls are cut up to make the paper units, and so their origin as artworks in their own right is subsumed into Suh work, like individuals gathered into a society. Suh compresses these multitudes of creations, the fits and starts, warm-up exercises and failed attempts, scrawls of ink that seemed important at the time, only later to be found lacking, into these rolls of cut paper, making their origins unrecognizable and anonymous, while preserving them and even celebrating their collective authors. Rather than being seen as wasted efforts, the castoffs Suh has gathered to make his work become a sort of informal collaboration among peers. He seems to acknowledge this implicit collaboration in the piece titled “A Forest of Writing,” in which the ends of the paper tubes are seen tightly packed together, where the title suggests a profusion of language hidden from view, crowded into a sort of archive. The title also echoes a line in the poem “Correspondences” by the poet and critic Charles Baudelaire: “Man passes through forests of symbols,” ones that the artist is more responsive to than others are. This work, like the others, presents a topography of the structural relationship among artists in the cumulative effect of all these individual paper pieces, each an artwork in itself, pressed into a sort of survey of artistic endeavor. One can then see in the ink stains and irregular pigmentation in this work a re-working of traditional Asian painting to bring it into the modernist practice of forefronting materials with minimal change to their characteristics. What appears to be a severance from Asian painting in Suh’s work is instead a continuity of the practice in a new guise, renewed and updated by switching from images created by brushing ink onto paper, to the paper itself, along with its incidental marks and colors, creating an overall form and image. Again, Suh blurs the distinctions between painting and sculpture with these pieces, in keeping with the pervasiveness of multimedia in contemporary art, yet the captivating surface of each work ultimately derives its formal power by packing in countless pieces of paper marked up in keeping with an ancient mode of art making. 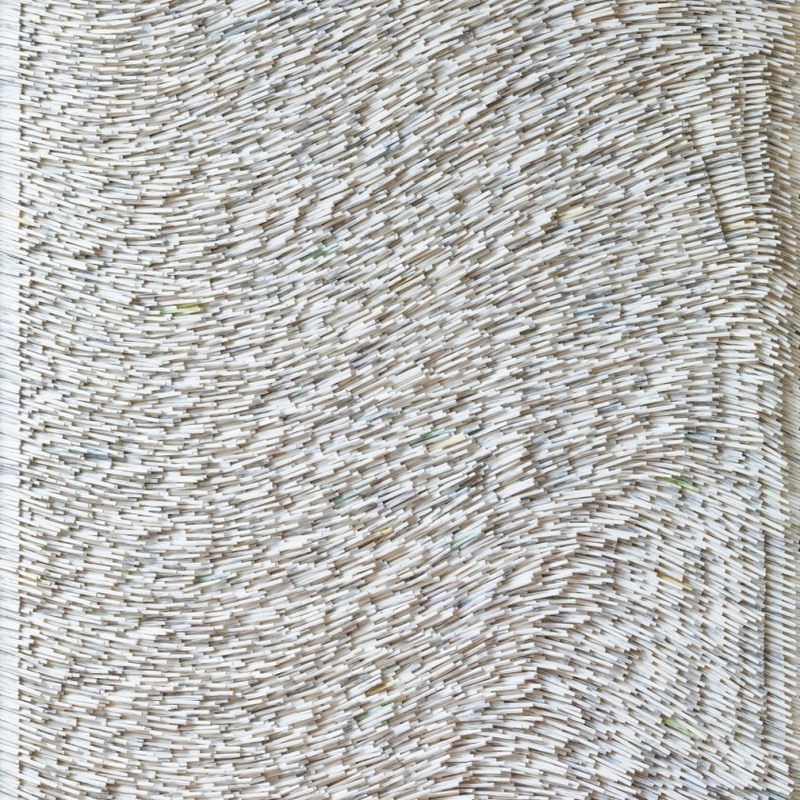 While some Western artists have used accumulations of pre-made or found material in their work, such as Arman and John Chamberlin, Suh differs from them in choosing the paper scrolls, which arise from traditional Asian artistic practices, as well as being handmade rather than manufactured. Another key difference is that Suh’s work does not stem from popular culture per se, but from the deeper currents of traditional culture made relevant to a contemporary audience through a transformation of materials, as mentioned earlier. The edges of some of Suh’s works have readable snippets of hangeul, the Korean language, suggesting signage or captions, although they probably function more as abstract forms placed randomly. Viewers not familiar with the language might be interested to know that hangeul is a phonetic script, rather than a logographic one in the case of written Chinese, and can be printed both horizontally and vertically. 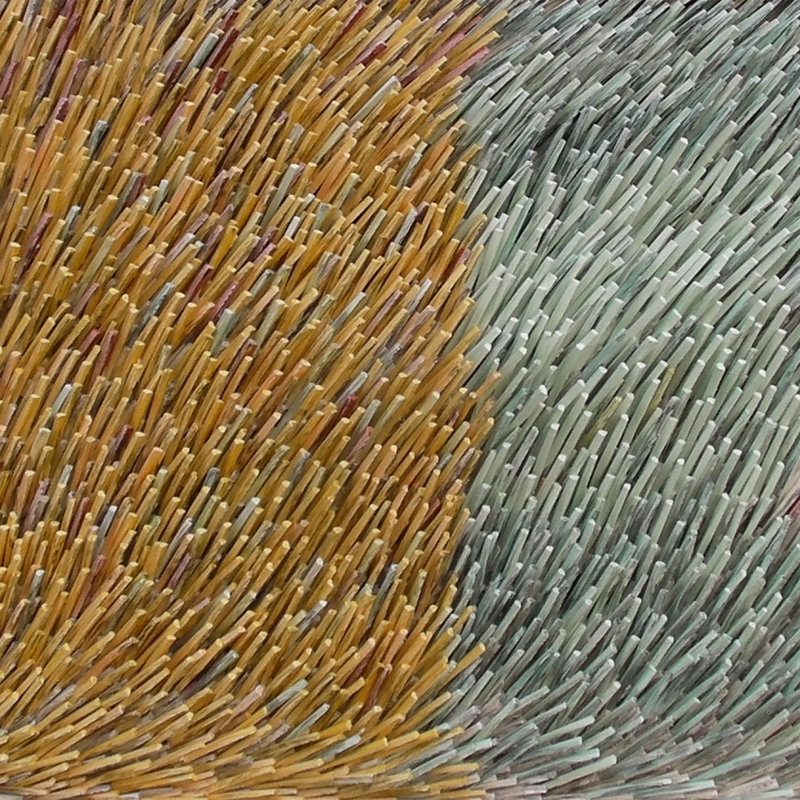 It too, along with the type of paper it appears on in Suh’s work, is indigenous to Korea and reinforces the uniqueness of these pieces in relation to the milieu in which they were made. 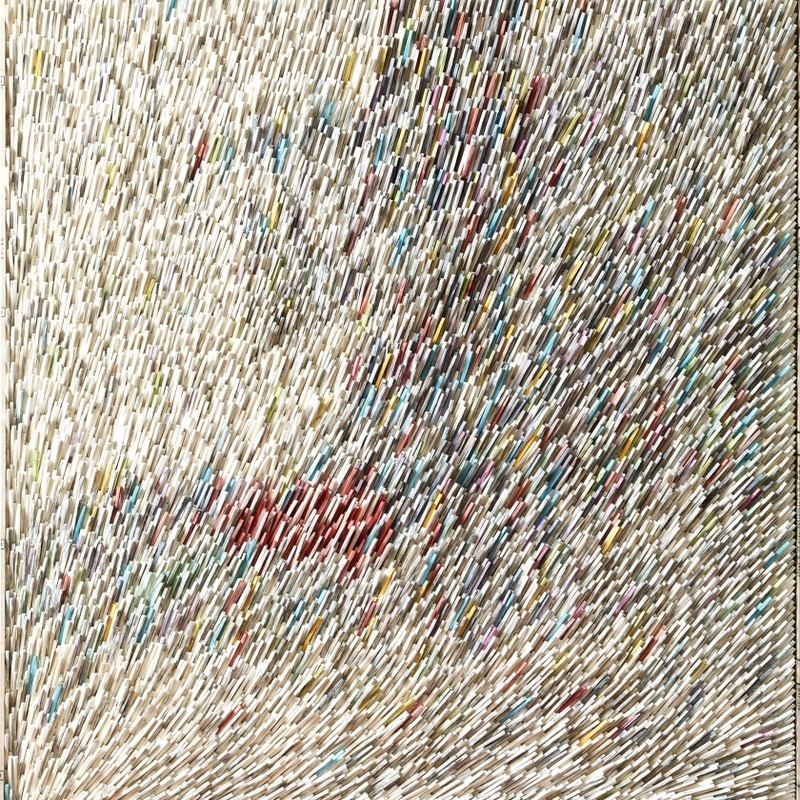 In other pieces, the paper, rather than being tightly rolled or stacked, is layered in stacks or shaped into massive rolls, suggesting modern printing presses and the industrial uses of paper, although Suh maintains the allusion to scroll painting by adding a wash of ink around them that bleeds into the canvas support. 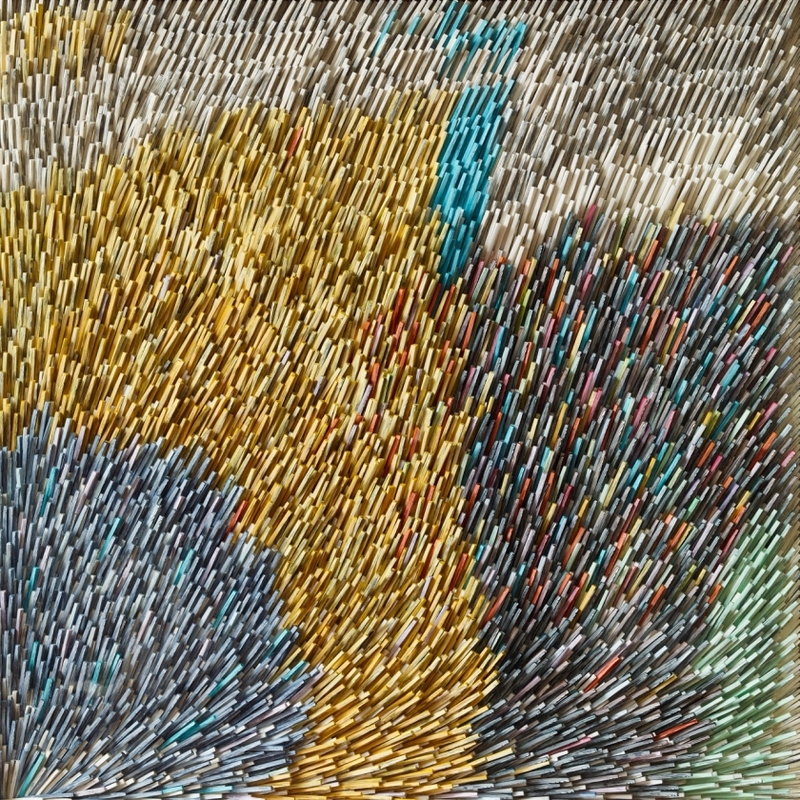 Suh has also continued to use graphite in more recent works, this time not for making drawings, as was mentioned earlier, but in wall pieces with apertures in them that contain dozens of colorful pencil stubs spilling out onto a thickly applied graphite field. These playful works allude to their own making by including the tools that created their dense, dark grey surfaces. The square and rectangular openings holding the pencils echo the similar geometric shapes found in his other works. Prior to making the constructions with hanji paper Suh painted landscapes in an area of the Korean countryside where communities still live in traditional-styled homes, called hanok in Korean. 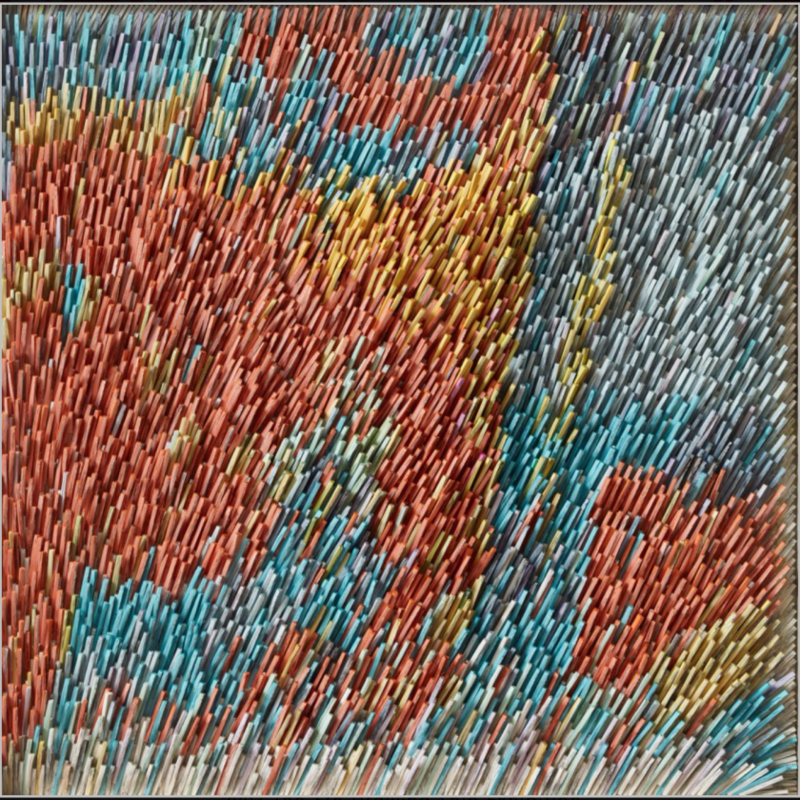 Seen from above clustered together, these homes, with their distinctive colored-tile roofs, are rendered as nearly abstract horizontal bands that cut across the composition in his paintings. The choice of imagery indicates Suh’s attraction to traditional culture while already hinting at the shift toward abstraction he would make in the more recent artworks. In Suh’s artwork one can sense an attentiveness to time-honored practices in Asian art, particularly the craft of papermaking in Korea and scroll painting, along with an innovative approach to these practices that distills their material essence. Traditions that have been marginalized by the onward rush of technological progress are given a privileged status for contemporary viewers, a new relevance that might have seemed unattainable before. Suh presents aspects of Korean culture in a non-historicized, vital way in artwork that extends the formal possibilities of contemporary art.